Milk Chocolate topped with DREAM Real White Chocolate. Full Cream Milk, Sugar, Cocoa Butter, Milk Solids, Cocoa Mass, Emulsifiers (Soy Lecithin, E476), Flavours. I love this chocolate it is my number one! :) Shame you cant get it in England though :( good thing this site does it :D. So yummy white chocolate and milk combined!!! Absolutely lovely, melt in the mouth taste. 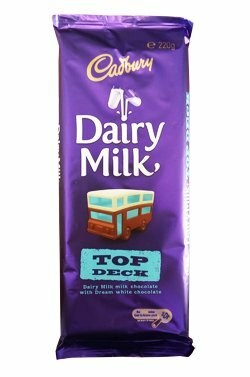 Top Deck is the best Chocolate i have ever tasted and cannot for the life of me find anywhere that does it anymore!